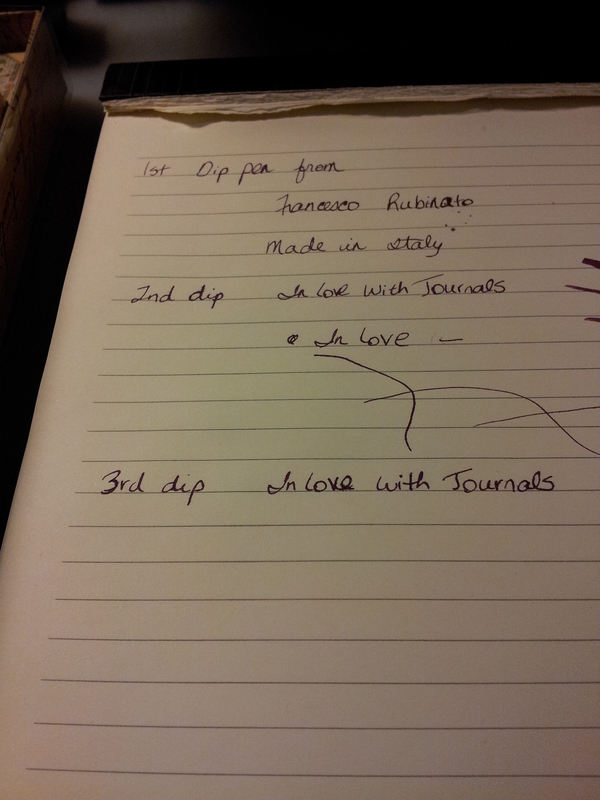 Last month we hosted my husband’s cousin and her husband, who hail from Chieti, Italy. They were visiting Canada as part of their holiday. And they came bearing gifts. 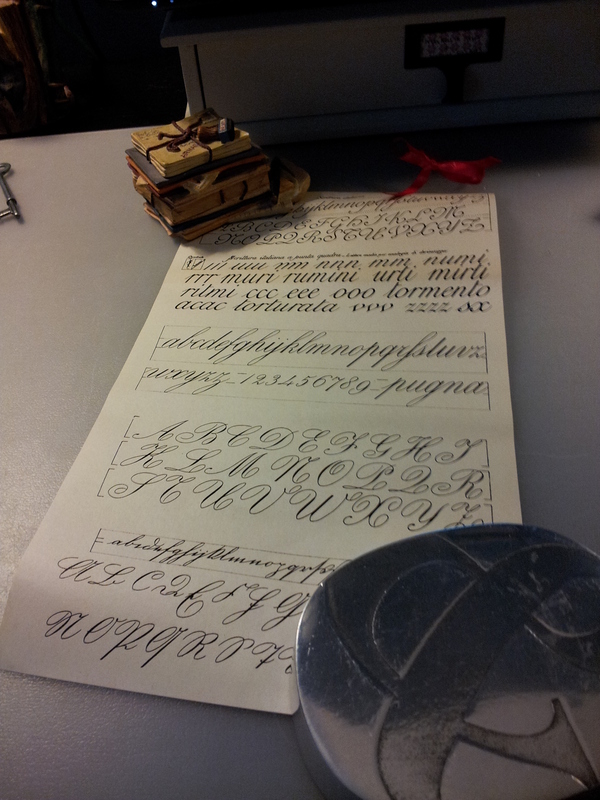 I was presented with a dip pen made by Francesco Rubinato, and I almost fell out of my chair. It’s so beautiful it’s taken me this long to get it out of the package and try it out. 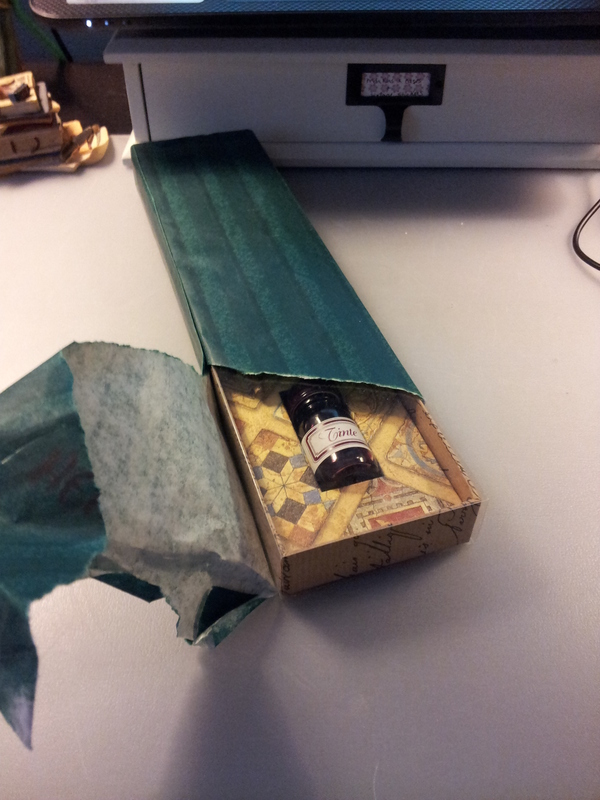 The packaging is “old world” most definitely. 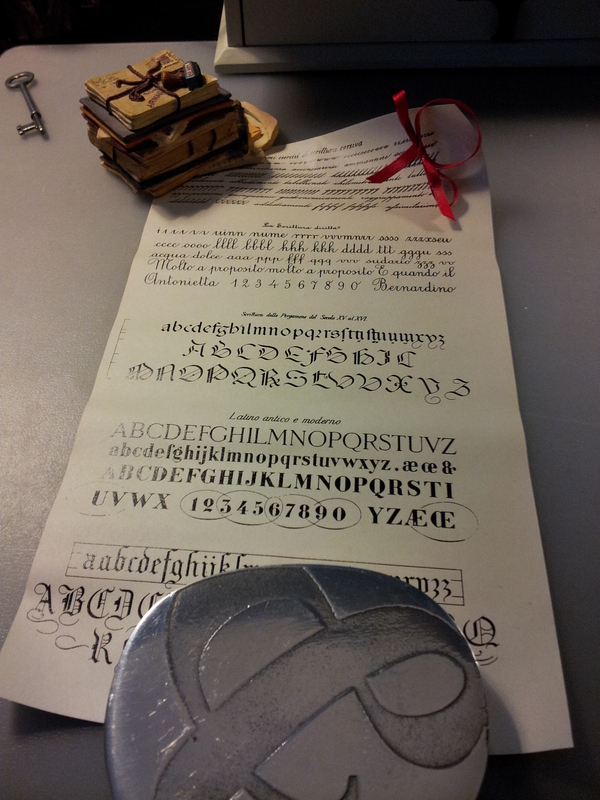 The set comes with a dip pen, a bottle of ink and a scroll with practice letters displayed in the different forms of calligraphy. This is the information card. Apparently the pen is hand made. I looked up Francesco Rubinato; if you want to read more about the company click here. And if you want to drool take a look at their products. 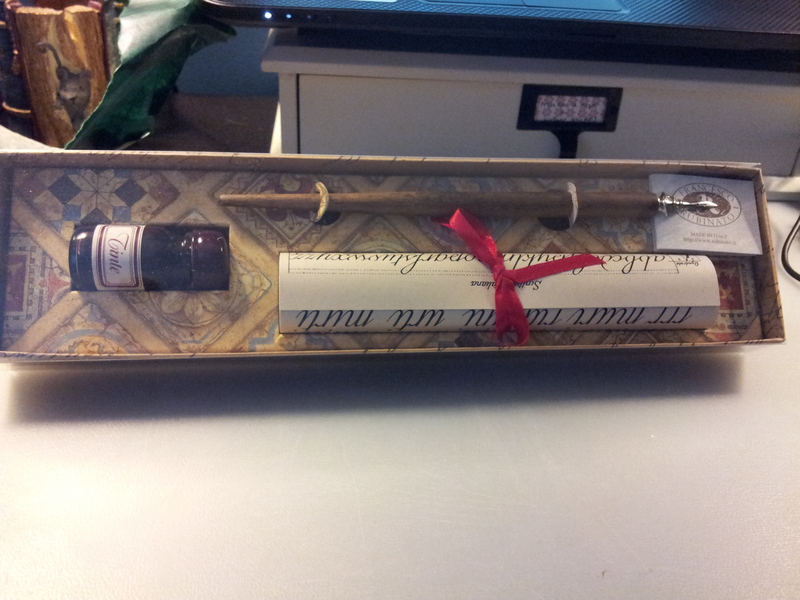 …and the other side of the scroll. If only I could make the letters shown here! I did do a writing sample but don’t expect anything like this lettering. The nib felt incredibly delicate and like it would snap at any moment. I had to keep reminding myself to reduce the pressure in my fingers. It was very scratchy but that is because I’m not used to it I’m sure. In the photo above you can see I went back to the ink bottle three times. There is considerable feathering with this ink/paper combination. 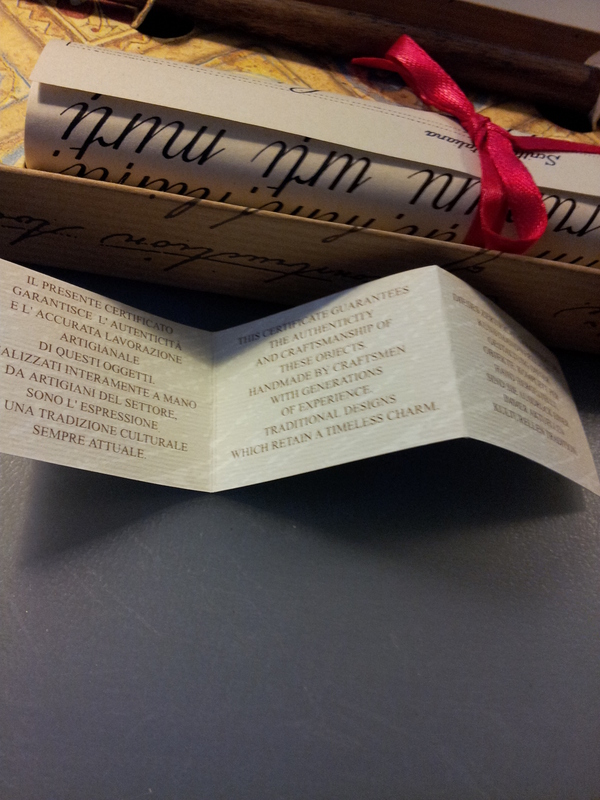 The ink came with the set and the paper is from Grand & Toy and is called Virtuo. I’ve used fountain pen ink on it before with no feathering. 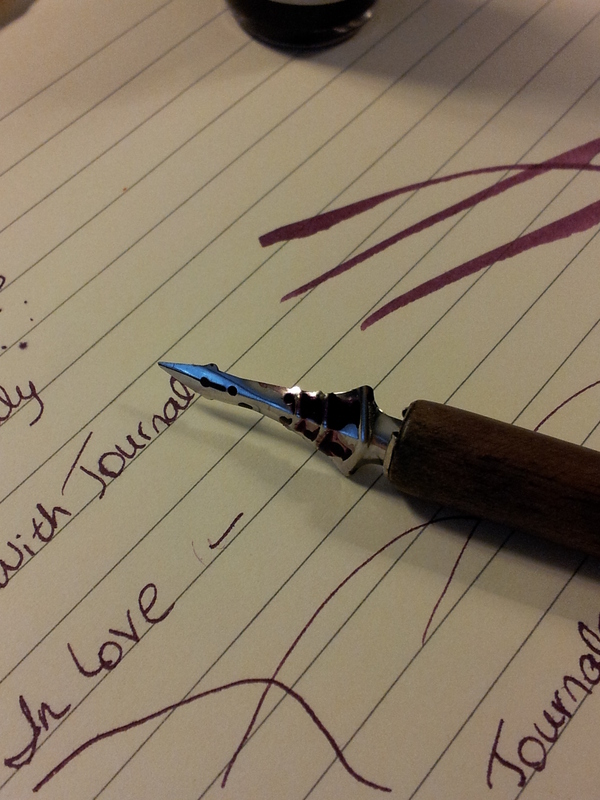 I suspect I need to use specific calligraphy paper for this nib and ink. Here’s a close-up of the nib, with splotches of ink. 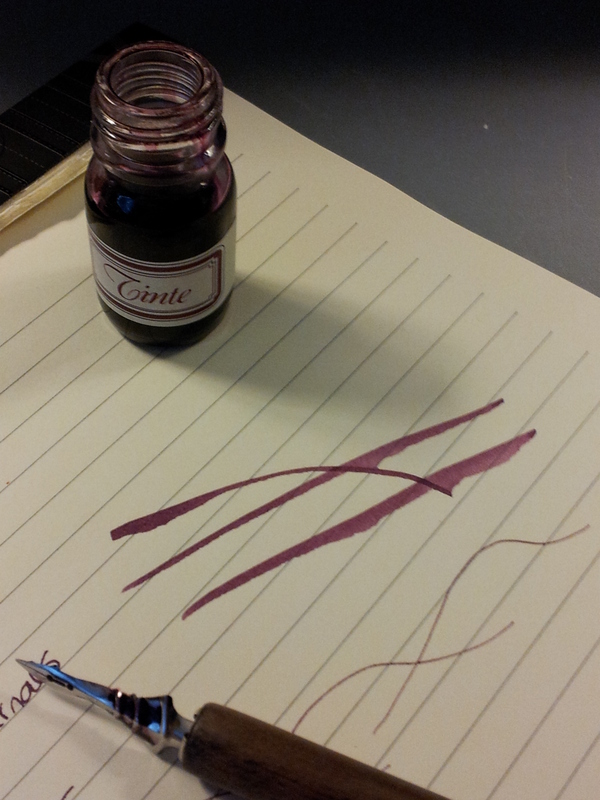 The ink is a beautiful deep pink/purple colour. “Tinte” in Italian means “colors”, according to Google Translator. It also told me it means “dye” in Spanish. Either way it’s appropriate I think. So many thanks to our beautiful Italian cousins; we had a wonderful evening and I’m so grateful for this gorgeous pen and ink!